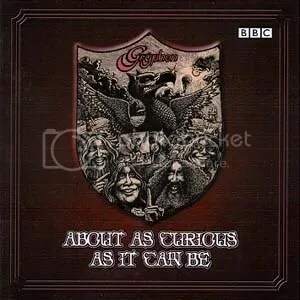 Gryphon is an English band that is relatively well known, but mostly for their 1974 album “Red Queen to Gryphon Three”. Their other albums like “Midnight Mushrumps” and “Raindance”, while generally not as well received, have more of folky or medieval vibe that I appreciate a great deal more than the symphonic stylings of Red Queen. This is an instrumental live album focusing on material from those other albums, released in 2002 but drawn from a couple of BBC sessions recorded in 1974 and 75. It’s definitely not a perfect album, in fact the middle section is quite poor in my opinion. However, superb epic tracks like “Midnight Mushrumps”, “Ethelion” and especially “Ein Klein Heldenleben” make up the bulk of the sets and are just as good or better than their studio album versions. The bassoon playing on this album is some of the best I’ve heard, so if you’re a sucker for some awesome bassoon (as I am) you’re sure to find something you like. One point of note: the first song is called “Renaissance Dance Medley” which is ridiculous and may be the worst song title I’ve ever heard, but please don’t let that stop you from giving this a chance.